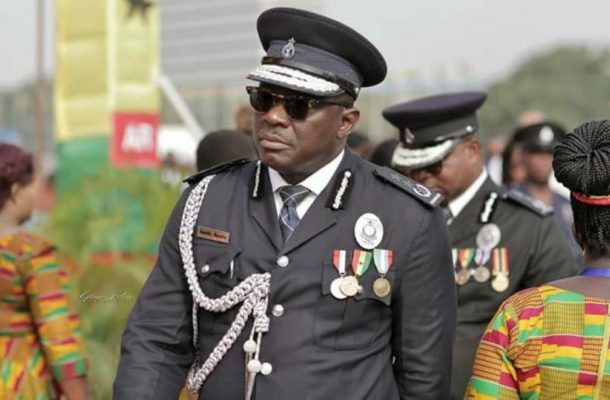 The Inspector General of Police David Asante-Apeatu has sent a stern warning to leadership of political parties his outfit will deal ruthlessly with any of their supporters engaging in political vigilantism. Addressing the media Thursday at the police headquarters in Accra, Asante-Apeatu served notice the police will “not tolerate any form of political violence” going forward. “Denounce vigilante groups,” the ballistic expert stressed. The police boss appealed to the general public to assist the law enforcement agency in fighting crime. “We must be united against recklessness, vandalism and criminality. Political vigilantism is illegal and we’ll guard against it,” Asante-Apeatu stated. His comments follow recent violence in the Ayawaso West Wuogon constituency during a by-election. Masked men in national security gear and being driven in a police branded vehicle were captured on tape brutalizing civilians during the polls. The Minister of State in charge of National Security Bryan Acheampong owned up to deploring the men in the constituency. President Akufo-Addo has instituted a three-member commission of inquiry to investigate circumstances leading to six persons sustaining gunshot wounds.